Around the world, ethnic Indian jewellery has been described as ‘elaborate’, ‘hypnotic’, ‘extravagant’, and ‘intricate’. To the connoisseurs of jewels, traditional & ancient jewellery styles have always been fascinating for the sheer amount of craftsmanship it entails. One such form of jewellery, one of the oldest in India, is Kundan jewellery, hailed for its stately and resplendent appearance and masterful crafting. Kundan jewellery is a regular feature on actresses in Bollywood epics, an essential bridal adornment and the pride and joy of Indian women across demographics. It is a form of gemstone and glass jewellery that is set between gold foils. Its defining features are its precious and semi-precious polished gemstones that are set in layers upon layers of beautiful shapes and patterns. Kundan means highly refined pure gold, and this type of jewellery involves 24k pure gold. India’s obsession with jewellery began with the advent of Indus Valley civilisation more than 5000 years ago, and since then numerous styles of jewellery making have been created and mastered. 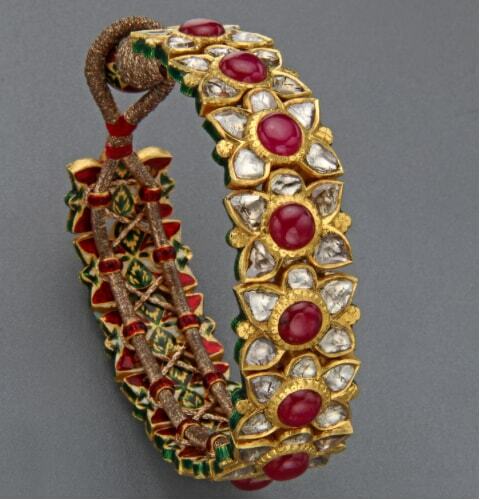 The art of Kundan jewellery flourished in the royal courts of Rajasthan and Gujarat under the encouragement and patronage of the Mughals from the 16th century onwards. However, the craft had already been in use prior to Mughal involvement. But the Mughals gave it a new impetus. It is said that many Kundan crafting and setting styles were passed on to the artisans of Rajasthan and Gujarat from Delhi courts. Kings and statesmen of ancient India not only commissioned jewellery made of Kundan stones but also used Kundan work in the design of their royal attires and even as an embellishment on royal furniture. Another name for this traditional art or technique is Kundan Keshari. Long man-hours are consumed by creating a Kundan masterpiece. The process is highly complex too. Each process has a specially designated craftsman in most cases since a finely matured skill is needed at every stage. It starts with the construction of the skeletal framework which is known as ‘Ghaat’, followed by the procedure of ‘Paadh’ where lac or natural resin is poured into the base and shaped according to the Kundan set designs. The next stage is called ‘Khudai’ where the uncut, shaped, polished (multi-coloured or single coloured) gemstones, as well as glass, are laid upon the framework. More Kundan or melted gold is added to the edges for a neat, polished look. Details are fine-tuned with the addition of Meenakari at this stage. After that, the process of ‘Pakai’ involves adding the gold foils to hold the piece firmly together. The final stage is the ‘Chillai’ where the gemstones are properly polished. The addition of stunning Meenakari engravings makes the piece a reversible wear. While artisans and modern makers of Kundan jewellery experiment with diverse stones regularly, the most commonly seen gemstones in Kundan jewellery designs are pearls, diamonds, emeralds, sapphire, topaz, ruby, agate, garnet, crystal, amethyst and jade. Polki involves using uncut, raw diamonds without any processing. The rustic look of uncut diamonds in Polki is highly expensive and coveted. Many aristocratic and wealthy families give them as precious heirlooms. 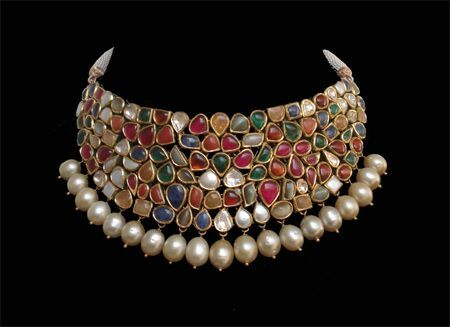 Polki is known to be more expensive and illustrious than Kundan jewellery. Jadau is nothing but the technique used to make Kundan as well as Polki Jewellery. Kundan jewellery is always in demand, even more so during the wedding season. No Indian bridal ensemble is considered complete without a lavish inclusion of Kundan Jewellery. Aside from weddings, Kundan jewellery is worn at any social gathering, celebration or religious ceremonies. 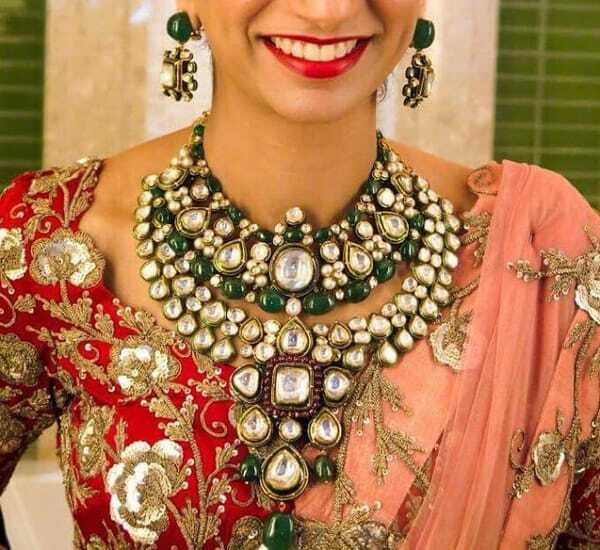 Millions of women buy Kundan jewellery to complement their Indian attires and some even wear them with contemporary, western outfits as a style statement. Authentic Kundan jewellery is special for its flawless finishing and age-old crafting techniques which makes them a good investment too. Quite a large number of women in India are inspired by Bollywood fashion. The popularity of Kundan jewellery was given a mainstream push when movies like ‘Jodha Akbar’ and ‘Ram Leela’ portray their leading women wearing mesmerising Kundan jewellery that set the screen on fire. The fanfare gets even more crazed when famous Bollywood actresses like Aishwarya Rai, Shilpa Shetty and Kareena Kapoor wear designer Kundan jewellery on their wedding days. The Indian entertainment industry, including television bahus and movie divas, have contributed majorly in drawing attention to this traditional jewellery style. A Kundan jewellery set typically includes an elaborate necklace and equally elaborate pair of Kundan earrings. A Kundan bridal set comes with a maang tikka and matching cuffs and head ornaments too and is heavier and more embellished than a regular Kundan set. You can also buy a Kundan choker, Kundan bracelets, Kundan rings and nose rings, cuffs (and haath phools), anklets (paizaab), arm bracelets and head accessories. Kundan jewellery also comes in out-of-the-box designs with motifs like animals petals and flowers, and celestial bodies. Standalone necklaces, chains, earrings and pendants are also available in Kundan. 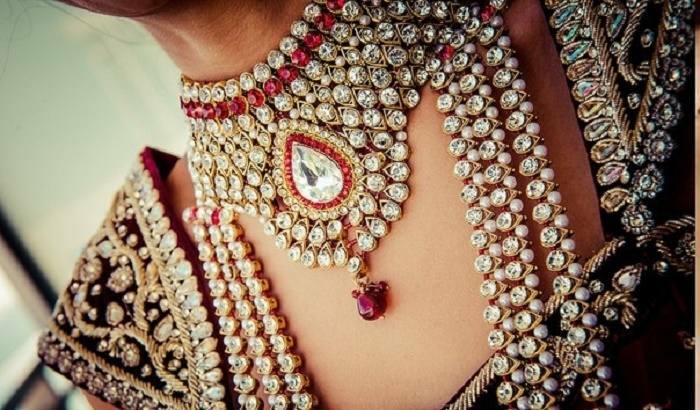 How much does Kundan Jewellery cost? Handmade Kundan Jewellery made with real gold and expensive gemstones can cost anywhere from Rs. 50,000 to Rs. 5,00,000 Lakh. But because Kundan jewellery has become a type of in-vogue fashion jewellery among the young women of India, you can find reasonably priced sets and pieces starting from Rs. 5000 (sometimes even less). 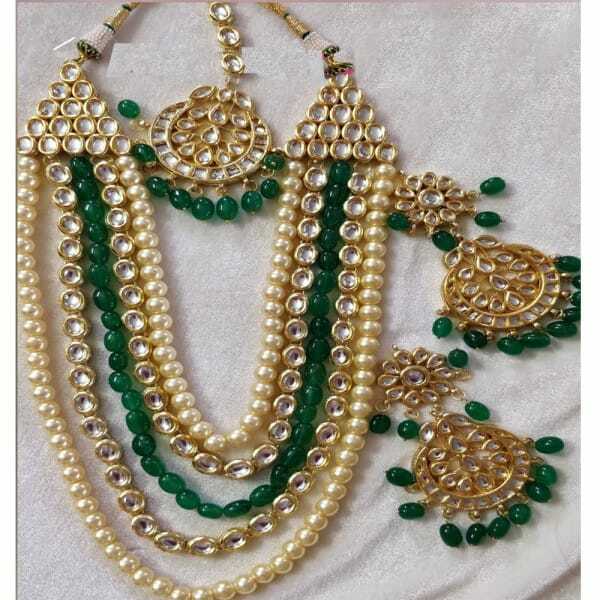 These are not made from pure gold, they are imitation Kundan jewellery sets, hence the lower price. But if you aren’t fussy about the imitation aspect of it, such affordable Kundan sets are a fine replacement for a pure gemstone and gold Kundan set. The truth about Kundan jewellery is that because of its beauty and popularity, imitation versions, and artificial Kundan jewellery, are abundantly available in brick and mortar shops as well as online. These are really affordable brass or metal interpretations of the real deal, hence you will find many women wearing them and perhaps even flaunting them. There are suppliers, jewellers and brands that sell real Kundan but don’t always use the modern-day mass marketing tools, instead they rely on the quality of their product to speak for itself and on massive word of mouth advertising. While buying Kundan jewellery, check for two types of certifications or stamps. One is IGI certificate which is by International Gemological Institute which certifies the purity of precious stones and the other is BIS Hallmark which certifies the purity of gold and silver. Buy from a renowned jeweller or jewellery brand which has been trusted for years. If the gold turns black or green after some time, it is not real and if the silver doesn’t change colour slightly it is fake. Also if a magnet is pulled by the jewellery, it is fake. Jaipur: Jaipur in Rajasthan is known as the centre for the best Kundan designs, specifically the Johri Bazaar in Jaipur. Bikaner and Nathdwara are also well-known for their Kundan craft. Big cities in Gujarat like Ahmedabad and Baroda also sell great Kundan Jewellery. 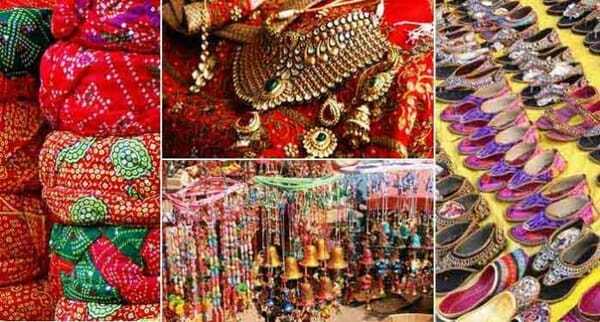 Delhi and Hyderabad are also good destinations to go Kundan shopping. Branded Stores: If you choose to buy Kundan jewellery from a national brand, you can either visit their showroom in your city or buy their collection online too. Some famous brands that sell Kundan sets are TBZ, Kalyan Jewellers, Velvetcase, Haritika Jewellery, Paliwal Jewellers, Rivaah by Tanishq, Suhani Pittie, Mangat Rai, Malabar Gold & Diamonds, Sabyasachi Jewellery, etc. Online shopping: Albeit online marketplaces sell everything at your convenience, we suggest that buying Kundan should be experienced in person at a physical store or in an authentic setting of Rajasthan or Gujarat. The rarest and the most ethnic pieces of Kundan may not be available online. The thrill of hunting for handmade Kundan jewellery inside a crowded and lively jewellery bazaar of Jaipur or Hyderabad is an experience to cherish. 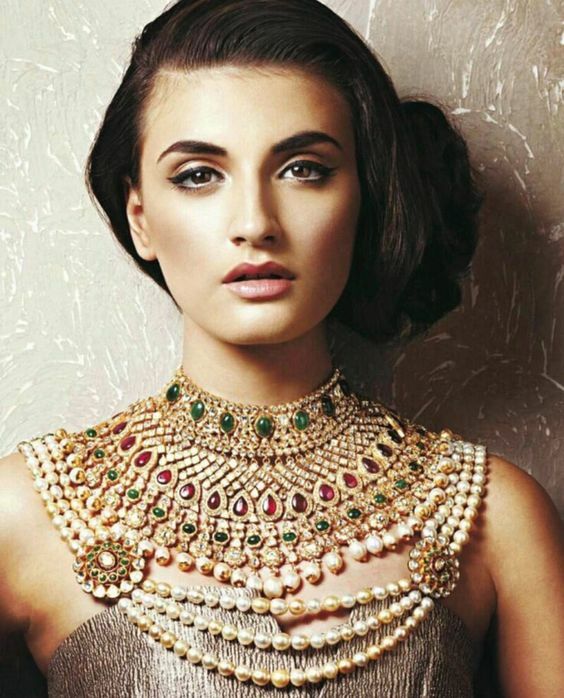 Does Kundan Jewellery Cost More Than Gold? Kundan jewellery is expensive because of its intricate craftwork and gold content. A Kundan Jewellery set to cost Rs. 50,000 and above. However, when compared to jewellery made purely of gold, Kundan jewellery made in the same karat of gold is not as pricey. This is because Kundan jewellery uses glass stones and doesn’t usually have a very high gold content. How to clean Kundan Jewellery? To clean the surface area of a Kundan jewellery piece, it is best to use soft suede cloth or velvet. It has a non-abrasive surface that doesn’t scratch or harm the jewellery. Avoid spraying perfume on the hands and neck when wearing a Kundan necklace and bracelet. The content of perfume can damage Kundan jewellery in the long run. While cleaning Kundan jewellery, avoid using chemical solutions and liquid soaps. The chemicals in these solutions are harsh and can cause stains that make Kundan jewellery lose its colour. To keep Kundan jewellery shining, avoid storing the pieces together. It is best to store each piece in its own pouch or box so that it does not bump against another and create scratches. To keep Kundan jewellery in prime condition, store it carefully in boxes and get it checked on a regular basis to make sure the stones and links are not lost. If the jewellery is hard or clean or tarnished, get a professional cleaning done by a jeweller who is experienced in repairing and polishing Kundan jewellery. What if Kundan Jewellery Gets Black? If Kundan jewellery gets black, rub an eraser over the blackened spot – the tarnish should be taken care of. If a major portion of a Kundan necklace or a bracelet gets black, it is best to take it to a jeweller for polishing. To avoid Kundan jewellery from getting black spots, it is best to store it in a place that is free from a lot of moisture. How to Identify Real Kundan? 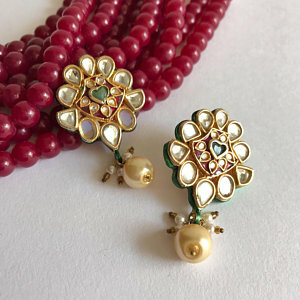 Buy Kundan jewellery from a reputed jewellery store. Reputed jewellers have a reputation to maintain and they would not stock Kundan jewellery that is anything but genuine. A good and easy way to test if Kundan jewellery is real by putting a magnet near the piece. If the magnet attracts the Kundan jewellery, it is fake. Although you might realise it late, if a Kundan jewellery piece you own turns black, it could be fake. If it is silver and it doesn’t turn dark and tarnish after a while, it is not silver but another metal. Look out for stamps, Kundan jewellery pieces come with stamps that notify its originality. Kundan jewellery is made by Rajasthani craftsmen and requires impeccable finesse and attention to detail. Kundan jewellery has layers upon layers of stone and precious metal. 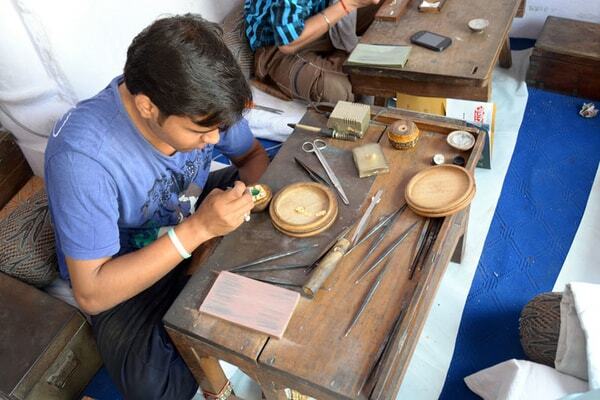 Flat or uncut stones are set on 24-carat gold jewellery using lac and fine gold foils.